The Halifax Visitor Centre has moved into its new home at The Piece Hall, just in time for English Tourism Week. After almost 18 months in Halifax Central Library, the information centre has now moved into a unit on the second floor colonnade level of The Piece Hall, allowing it to open seven days a week. The move coincides with the build up to English Tourism Week, which takes place from Saturday 30 March – Sunday 7 April and celebrates the work of tourism businesses, organisations and people that support the industry across the country. The visitor economy is worth £106 billion a year to England, supporting thousands of businesses, including restaurants, pubs, farming, transport, retailing, sport, museums and galleries, the theatre and other performing arts. Tourism in Calderdale is big business; worth a staggering £341 million per year and employing 7% of all employees in the borough. Visitors come to Calderdale from far and wide, with so much to do regardless of the season or the weather. The area has a wealth of visitor attractions, home grown festivals, inspiring heritage and stunning landscapes. One of the ways in which visitors like to find out more about the area is by speaking to visitor information staff. Calderdale has three information centres across the valley in Todmorden, Hebden Bridge and Halifax, where experienced staff are on hand to advise visitors and locals alike about where to eat, drink and stay and those must see attractions and festivals. The Halifax Visitor Centre has its own Facebook page and twitter account for visitors to get up-to-the-minute information when they arrive in the town. The Centre staff also support other organisations providing a booking facility for guided tours and events that take place throughout the year. “We are delighted to be back in The Piece Hall, with our own unit giving us much more space. 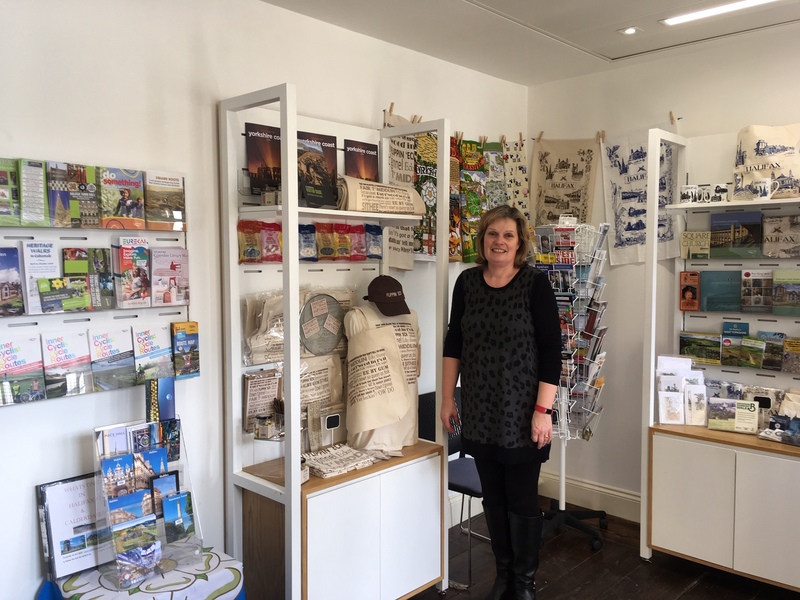 “In the first week alone we have served so many more visitors wanting to find out about Halifax and Calderdale, or to buy a souvenir that is locally sourced or Yorkshire themed. For more information on what to do throughout English Tourism Week pop into one of the Visitor Information Centres across Calderdale or take a look at visitcalderdale.com for inspiration. This entry was posted in Piece Hall, Tourism. Bookmark the permalink.